There is a growing host of experts who tell me that you, and your generation, are smarter than me and my generation. They say that IQs are becoming higher with each successive generation; something they call the Flynn Effect http://en.wikipedia.org/wiki/Flynn_effect ; and that your brain will be re-wired by the tools you use and that you will grow even smarter. Marc Prensky calls you a “digital native” and Don Tapscott calls you a “millennial”. Their studies are now beyond mere guesses. 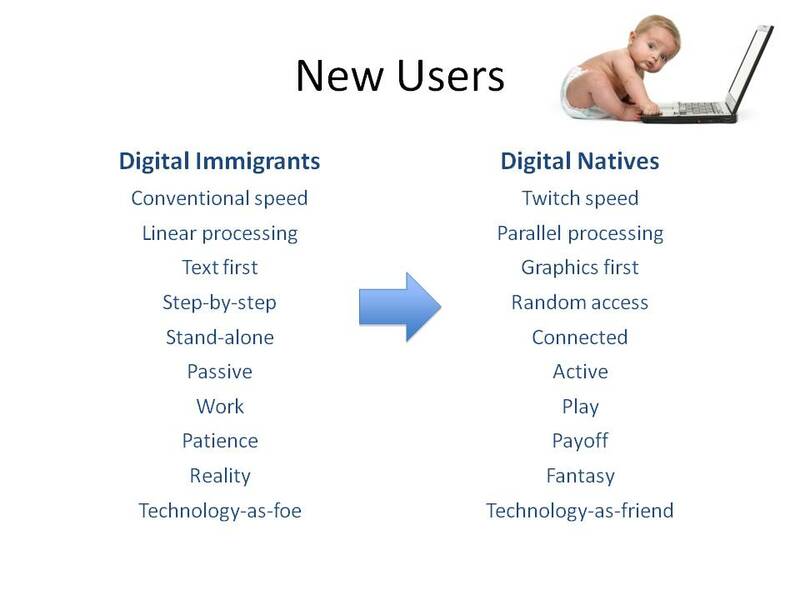 In Tapscott’s book “Grown up Digital” he provides hard data on exactly how you are different. The data says that the morphology of your brain will be reshaped in much the same way that London Taxi cab driver brains are physically changed by the constant challenge of navigating the impossible London spaghetti string maps. “The things we make, make us” is now a jeep commercial, but the first time I remember that concept was when I read Marshall McLuhan’s “Understanding Media”. McLuhan said that my baby boomer brain was remapped by television; that the medium itself changed my preference for receiving information, how I socialize with others and how I process the world around me. You see Dylan, the last century was the first televised century. We are able now to go back and revisit the major events and re-interpret them from recordings. There are people who are seriously debating whether or not this century in which you were born will see time travel become possible. It is all about sensors. Moore’s Law is tracking how processor speed is doubling in price performance every eighteen months or so. Recording devices including sensors of various kinds all dance to the Moore’s Law beat and are also improving in price performance. They are beginning to become embedded everywhere, even in cellular phones and tablets. This has caused an explosion of data, most of it recordings from sensors. They say you can not walk through London without being recorded permanently to some cloud-based storage medium. Maybe some day you will be able to pull up a temporal place in time and stand there and watch yourself walk by. Your children and theirs may be able to see the day you and your wife met and play it back again and again from every possible angle. Google Earth street view is only the beginning, Dylan, but whatever comes will be as natural as breathing to you and your generation. The first time I caught your sister swiping her hand across the flat screen of our television to change the channel at two years old I knew that something profound was happening to humanity. When she held a birthday party for our robotic vacuum cleaner I had a mild case of post modern future shock that was only quenched by half a bottle of Flaccianello. I do not yet know what the future holds for you and the rest of humanity. Is all of this an evolutionary half step that has us slouching towards some symbiotic relationship with technology? Will we fuse with it to become what Hans Moravec calls “ourselves in more potent form” or will we upload human consciousness into a new substrate, as Vernor Vinge and Ray Kurzweil suppose, surpassing the Singularity http://en.wikipedia.org/wiki/Technological_singularity to range out and populate the stars with mechanical robotic bodies? I hope we will have a lot of time to brood over these and other issues as soon as you have leveled up. In the meantime, remember that your old man may not be as smart as you, but he has experience and wisdom in painful abundance. Keep a defragged section of your morphologically changing brain reserved for what I have to share. The nearly complete fortress of solitude. It is Father’s Day, 2012. You are three weeks old today. It is noon and the day has been perfection, so far. I took you on your first tour of the nature trail. We startled a baby deer who jumped from the tall grass right across our path, and we watched a sand hill crane hunt the bog. This is the first day that it really appeared that you were seeing the World, your eyes catching and releasing on the swaying green branches as we walked, sunlight dappling your face, little coos of what I think were recognition issuing from your miniature lips. Your Mother considered a nature trail walk at three weeks old, risky behavior. What if that jumping deer caused me to drop you? Or what if I lost my balance on one of the steps up the hill? Risk management is a critical skill in our accelerating complex world. So, let’s talk about it. I think the sooner we start this particular dialogue the better because, as my son, you are likely to inherit my appetite for risk. There are two main kinds of risk: financial and physical. Financial risk has been in the news a lot recently. Risky use of capital has almost ruined the World in the years running up to your birth. As a result, the tolerance for risk appears to be diminishing. Banks aren’t lending and corporations aren’t spending; hoarding cash. There is a great deal of discussion about how much risk is prudent, and whether we should legislate how much should be legally allowed. This seems acutely un-American to me, and exactly the opposite of what we should be doing as complexity increases. (see my lecture on Moore’s Law) when we should be investing in innovation; the only thing that can save us. But then, I tend to look at the World a bit differently from the madding crowd. I have been an entrepreneur, working with my colleagues to raise over $50 million in capital over the last twenty years to form 6 different companies. My high stress threshold and hearty appetite for risk makes most people uncomfortable, but it has served me well. I have had an interesting life with many more adventures to come (hopefully). Maybe you and I will tilt at windmills together some day. I hope so. And maybe my later years will see a deeper prudence settle in me to counter any irrational exuberance you may exhibit. Calculated risk is the only risk to take in finance. But risk avoidance leads to inertia and stagnation. Personal risk is another matter altogether. I am unqualified to lecture you on it, since I have been so fast and loose with my own personal safety as I traveled the world looking for adventure and experience. When I couldn’t talk others into going with me I just went alone. I went alone to Moscow, to Tokyo, to Brazil and Egypt. I was chased through the streets of Sao Paulo by thugs, robbed at gun point by the Moscow police in the middle of the night in the blowing snow. I went to Egypt three weeks after the 1998 Luxor massacre, and was detained and interrogated by Israeli agents while trying to walk across the border at Eilat. I would like to say that most of my recklessness was in those years of high testosterone between 16 and 30. For the most part, that is true. 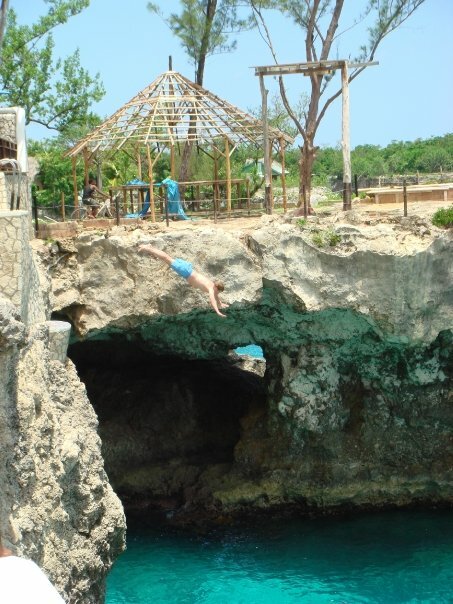 But as recently as three years ago I made the sober decision, against all advice to the contrary, to dive head first from the cliffs at Rick’s Cafe in Jamaica, my left elbow sprained and my back wrenched like I had been under the Inquisitor’s rack. There is a video of “the dive”. Your Mom will be very happy to show it to you as an object lesson about ignoring most of my advice. I very much want adventure for you. I can only imagine what is in store for you once the wanderlust kicks in and you get that adolescent bullet proof yearning for finding the limits of things. But I do hope to teach you risk management before it hits, so you get through it all in one piece. The fortress of solitude I have been building the last few months is nearly complete. Set forty yards into the woods it stands 15 feet in the air among the trees and overlooks the stream and bog. I tackled this project the way I approach software (and, some would say, life) planning to no more than 50%, then diving straight in, getting dirty and iterating as I learned. I never built anything of this scale or complexity before, but am now proud of every imperfection. I am most proud of the complex angles of the hip roof, and especially the translucency that lets the stars and nature in to watch you as you grow. In warm months a wall of green will insulate you from the confusion and clamor. In Winter the cold air and gray and brown sentinel-like trees will serve your need for separation. Electronic screens and teledevices are forbidden here. No electric light; only stars and candles when the day is quenched. As important as I believe it is, and as much as I want you to gain a comfortable fluency with the digital tools that are remaking the world, i want you to master distance from these tools as well, alone with your thoughts. Let this serve as one place among many for meditation and communion; a centrifuge for fleeing and ungathered insights, for contemplating lost and found love. I have come to know that many of the old axioms are true; that the unexamined life is not worth living: and I know you will come to need and appreciate this distance from the din. Are you ready for my latest theory? Nosferatu. Vampire. a) You have clearly gone nocturnal. Sleeping during the day and reserving all of your fiendish activity for the night. b) You are steadily draining your Mom’s life force during those night-long feedings with your insatiable thirst. c) Ears. Clearly bat-like and supernatural in proportion. I took you out into direct sunlight today while wearing oven mitts, just in case you burst into flames. You didn’t incinerate, nor did you glow or sparkle like in the movies; but you clearly didn’t like it very much. Listen, I know that dressing all dark and moody and brooding about with pale skin is all the rage these days. It is clear that this works on teenage chicks, but your Mom is really shriveling up on us a bit and I think we are both going to need her for the long haul. Can you postpone the feeding on the living stuff a bit, say, until puberty? That would be great. And it will be a lot more useful with the girls then. Oh, there is the door again. It’s that Van Helsing guy who keeps calling. Wants to pay his respects. I wonder what he wants? You picked a fairly ideal setting to grow up. We have a nice place here called Amber wood, on three and a half acres of rolling woodlands. There is a natural spring that babbles musically down to a swampy bog, with all manner of amphibians and creatures for your viewing and hunting pleasure. I also cut a quarter mile nature trail that loops through it and identified trees and shrubs marked with QR code signs. Your Mom swaps out the destination web pages just to keep us guessing. I also built two tree houses back in the woods. I would like to build a third, but your Mom has said enough. If you want another we will have to build it under cover of night or something. I have been dreaming about a zip line between them, but I don’t see any way of getting that past your Mother. Maybe you can work on her when you are older. Try to work it into a school extra credit project or something so she can’t say no. Your sister has populated the trail and woods with all manner of fantastic creatures with her imagination, including the usual complement of fairies and at least one Dragon named Leo and a troll named Snowflake who lives under a bridge I built over the stream. Her latest discovery is something called a Dresden Wood Elf Harpy.. These things are apparently quite fierce and present a bizarre appearance. I have asked her to make a sketch of one for you so you know it if and when you see it. Your sister and I have been keeping them at bay with magic and weapons over the last year. We look forward to you joining the battle. Your Mom won’t help. She actually looks askance at us when we don capes and swords and spells and potions to go out and do battle. Before you reach manhood I expect you will become very acquainted with the word “askance” and the disapproving look it describes from women of various ages and demeanors. We can talk about coping and avoidance strategies later. What the heck was that? I mean, what WAS that in your diaper? It looked like a half-digested frog. Are you really from the planet Vulcan? Do you scurry out in the middle of the night and gorge yourself on slimy amphibians by our pond? Or did you just realize it was my turn and decide to sacrifice one of your organs just to send me a message about these posts? Anyway, I have to go to Orlando today. So you be good to your Mom. And know this: I am on to you. Live long and prosper. But no more frogs please. Our neighbors can see that pond from their kitchen. I am in Orlando today. I hope you have not been a terrible burden on your poor Mother in my absence. It is really hot and humid here. I am surrounded by obese tourists at the airport. I am convinced they somehow contribute to the heat. Don’t grow up to be an obese tourist, son. It reflects poorly on the family and, if you travel abroad, it reflects poorly on America. You should always be neatly turned out for travel. Your Italian Nonna Artena will help you with this. I was in the woods and trying to think of point guard or wide receiver names for you. I still think Orlando Boyd sounds really cool. You can almost her the announcers weaving the name into the broadcast. DJ Boyd has a good sports announcer ring as well., but your Mom and I both briefly liked Orlando. It seemed to elicit your Italian heritage and sounds exotic. Of course, some of our friends in North Carina said that giving a boy a name like that can turn em gay. That’s how they said it, “turn ’em gay.” then they made this weird face like they were tasting a lemon. Now, I really don’t think that a name can turn you gay. But That got me to thinking and I do want you to know that if you do turn out gay it is ok with your Mom and me. The important thing is that you find a nice partner who can see beyond those ears. But you won’t be able to live in North Carolina. This state made it really clear with a passel of recent legislation that they don’t cotton to people with different ideas about human relationships. Come to think of it, I don’t think you can live with your grandparents in Italy either. The Italian piazza is a lovely place, but can be as cruel and judgmental as any hick town in North Carolina. What am I talking about? Oh yeah, it is hot here in Orlando. Anyway, I am sure you will be called back to your home planet when it is time to mate anyway, fighting with sharp weapons to that space music among the stars. I have news. I wanted you to hear this from me first. The thing is, we have decided against circumcision. I know, i know, all the other kids are doing it. But that doesn’t mean you have to. You see, your Mom is from Italy, and they don’t really go for that genital mutilation stuff over there. And your Dad likes to make decisions based on evidence. I am kind of funny that way. Turns out that the American Society of Pediatricians (or maybe it was the Mormons, I have forgotten) came out about five years ago saying that it was not medically necessary. And now many insurance companies don’t even cover genital mutilation. So, you can save up money and pay for it yourself if it becomes important to you. But we are holding off for now. I think you will thank me for this some day. And i think there is a good chance you will be a trend setter in this regard. Earlier I mentioned that your Mom is Italian. And not the kind from Jersey Shore who pronounces Bruschetta – Brewshetta (I noticed the Olive Garden commercials are finally getting it right), but a real full blooded Italian born near the Dolomites and about 40 miles from Venice. That makes you half Italian. The other bits are German and Scottish, from my mongrel side of the family.. So, you are a Scotch/German/Italian. I guess that means you are destined to be a cheap megalomaniac with a flair for style. We will have to study which of those powers you should level up first. On the birth certificate form I wanted to mark you down as Latino. My argument was that Italians created the latin language. You would get so many benefits, and likely a few hardships to go along with it, by having that designation. I think it would have been good for you. But your mother was against it, so I checked the box that said white. I know I already told you that white male is the easiest setting to play the game of life. Try to make the best of it. There was no box to check about Vulcan ears. I have been under a bit of stress and a little sleep deprived. Sorry about complaining about your very understandable needs. I mean, you are only two days old. As a man, I completely understand your wanting to play this stage to the hilt. Please accept my apologies. I will, however, your Mother’s remonstrances notwithstanding, not apologize for the comment about Spock ears. It’s the truth and you will just have to learn to live with it. Turn it into a strength somehow. You know, Hitler only had one testicle. Your Mom didn’t like me bringing up Hitler and posting it on Facebook. Hopefully the Interwebs spider search algorithms won’t forever jointly tag you two. What I was trying to say is that a weakness often brings forth compensating forces. So, in a way, you should be thankful for those freakish ears. Mom wanted me to add a reminder that you have an awesome Mom too. She said something about the definition of awesome is really when a woman goes through the pains of child birth naturally without the help of modern medicine etc etc yadda yadda yadda. You know how she can go on about herself. But you and I know the truth. We guys have to stick together. For the first two days of your life you have been very cool. I have been calling you Chillin’ Dylan because you don’t cry like we expected you to and you are so relaxed. But last night I feel you were starting to get a little greedy and whiny about your need for human contact and seemingly constant flow of breast milk. As your Dad I just want you to know that you might want to dial that back a bit. Also, you have Spock ears, so get off your high horse.